TEN/MET Secretariat is dedicated and positioned to continue to foster productive initiatives through collaboration with its members, partners. UN agencies and governments. TEN/MET shall continue to lead and pave the way in ensuring every Tanzanian child has access to inclusive, equitable and quality education. To address this aspiration, TEN/MET futuristic strategic plan guides organization strategic direction in the next five years. Through the strategic plan a new and innovative thinking has emerged where our role as a network reflect a national obligation as opposed to our past mode of operandi. As an umbrella organization we shall focus on national and international issues that affect education sector. Our advocacy themes and campaigns shall be developed to tackle major national issues that in one way or the other affect the performance of the education sector as a whole. Secretariat shall effectively continue to engage in policy dialogues and international forums that are aimed at bringing sustainable solutions to global challenges in education. 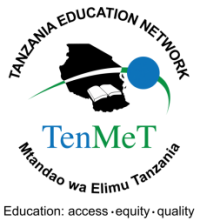 In addition to this, TEN/MET shall be at the forefront in representing its members in various platforms and forums. We hope to strengthen our communication and engagement with our members. On the same note we shall support our members technically and through enhancing their capacities to best execute their mandate and interventions. Our goal is to push education agenda in the country to new heights through collaboration, networking, partnership, research, advocacy and strategic alliances with partners and education stakeholders. TEN/MET shall continue to explore new possibilities and pioneer sustainable solutions in education sector in the country. It is vital we all strive to see a Tanzanian child accessing quality, inclusive and equitable education. Furthermore, as the coordinating unit of the network, the secretariat plans to bring newsletters each month focusing on a specific theme. Please get ready to share your insights and contributions into the sector. I am encouraged and excited about the future of education sector in the country and our collective roles as change agents, leaders, and developers of innovative solutions to help Tanzania education sector fully achieve its potential.